Star Wars Journeys – The Phantom Menace was the first animated storybook that LucasArts and Disney worked on together. The first episode costs $6.99 and is available exclusively on iOS. Today, we play through the first 6 chapters to give you a sense on what this brings to the table. 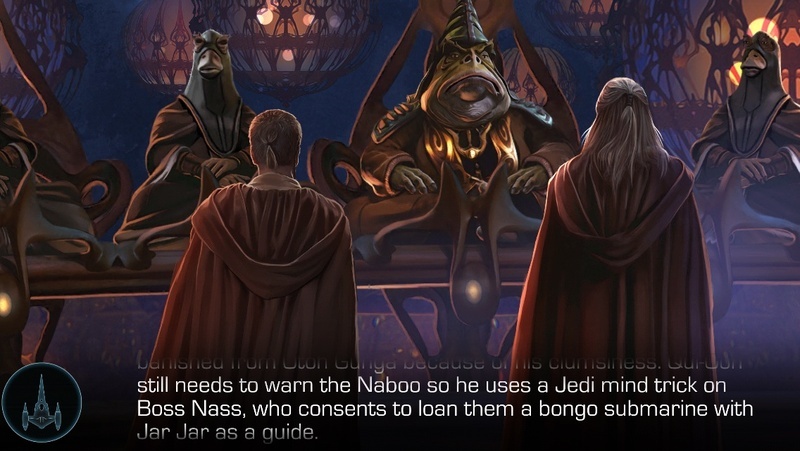 The first installment of the game walks you through the core events from the Episode 1 movie. There is all sorts of interesting dynamics, such as the ability to tilt the screen to see what is happening to the far left and far right. Often, there are characters and hidden animations that pop up if you click on secondary characters. One interesting sequence occurred during the rescue of Queen Amidala’s royal procession. You can click on the main characters and they chop down robots or force push them away, all the while making wisecracks. Whenever you click on a major character or NPC it will bring up an entry to the database. This is accessed from the main menu and gives you backstory and how the character is relevant to the first story installment. Today, we play the first six chapters and will do the next six in next few weeks. We will also show you the game mechanics behind the podracing mini game and how story unlocks enhance your racer.